^ Ward, Mark (14 September 2012). "Europe hits old internet address limits". BBC News. BBC. Retrieved 15 September 2012. ^ "African Network Information Center : -". my.afrinic.net. Retrieved 28 November 2018. ^ "Overview of the Advanced Networking Pack for Windows XP". web.archive.org. Archived from the original on 7 September 2017. Retrieved 15 April 2019. ^ Kaps, Reiko (13 April 2011). "IPv6: Privacy Extensions einschalten". Heise (in German). Retrieved 15 April 2019. 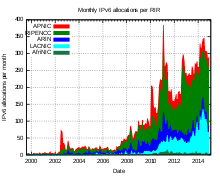 ^ "The History of Domain Names | IPv6". www.historyofdomainnames.com. Archived from the original on 12 June 2018. Retrieved 12 June 2018. ^ "Advisory Guidelines for 6to4 Deployment". IETF. RFC 6343. Retrieved 20 August 2012. 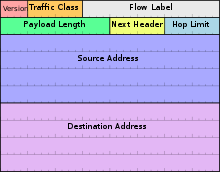 ^ "Basic Transition Mechanisms for IPv6 Hosts and Routers". IETF. RFC 4213. Retrieved 20 August 2012. ^ Enric Pujol (12 June 2017). "What stops IPv6 traffic in a dual-stack ISP?". www.apnic.net. Retrieved 13 June 2017. ^ "IP Version 6 Addressing Architecture". IETF. February 2006. RFC 4291. Retrieved 28 November 2017. ^ "Basic Socket Interface Extensions for IPv6". IETF. February 2003. p. 22. RFC 3493. Retrieved 28 November 2017. ^ Cicileo, Guillermo; Gagliano, Roque; O’Flaherty, Christian; et al. (October 2009). IPv6 For All: A Guide for IPv6 Usage and Application in Different Environments (PDF). p. 5. Retrieved 2 March 2013. ^ van Beijnum, Iljitsch (28 August 2014). "IPv6 adoption starting to add up to real numbers: 0.6 percent". Ars Technica. Retrieved 9 April 2015. ^ "Traffic Graphs | www.seattleix.net". www.seattleix.net. Retrieved 30 October 2017. ^ "AMS-IX - sFlow Statistics". stats.ams-ix.net. Retrieved 19 March 2019. ^ "Measurements | World IPv6 Launch". www.worldipv6launch.org. Retrieved 19 November 2018.